One of the most essential places on your wedding day is not your ceremony or reception venue, but where you choose to get ready for your wedding and how you choose to manage that time. This is the place where you prepare for one of the biggest, most exciting days of your life and it deserves to be more than an afterthought. Check out our tips on how to "get ready" for your wedding! Typically, the groom/groomsmen and bride/bridesmaids get ready separately. You will want to choose two separate locations or two hotel rooms to keep the specific parties together during this time. This way, everyone is accomplishing what needs to happen in a timely manner and mostly because when they separate it's like herding cats. Pick locations that are within a reasonable distance from your ceremony and reception venues if possible. Sometimes certain wedding venues offer bridal suites or you may be able to book hotel suites in your reception venue hotel. Either way, you want to make sure that these locations are accessible distances from your venues in regards to transportation. These locations also need to provide enough room for everyone. For example, fitting 10 bridesmaids plus 4 hair/makeup stylists into a regular hotel room is not my idea of a good time. The location should ideally provide enough elbow space, bathroom accessibility, kitchenette (if possible), and plenty of electrical outlets. Essentials for the guys typically include a wet-bar and TV, while for the girls it is important to have plenty of natural light for hair and makeup. Added bonus for the ladies if the location includes stools and good mirrors as well. Note, this is not applicable if you are having your hair/makeup done in a studio. When you have decided on your getting ready locations and timeline, don't forget to notify your bridal party! Even if it's in advance, your bridal party will appreciate the heads up when determining their day-of plans for your wedding. 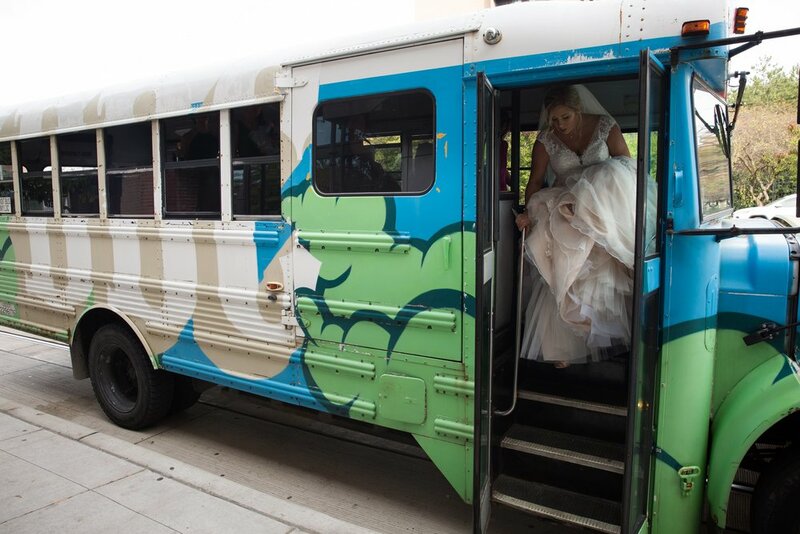 This is especially important if you plan on providing transportation from the getting ready locations to the wedding venues, this way everyone can figure out what to do with their cars. Let your bridal party know where they need to be and exactly when they need to be there. Also, include a list of what everyone should bring to the locations as well. Once you arrive at the getting ready location, it's time to bust out all of your wedding day look items. That means lay out your shoes, accessories, veil/headpiece. clutch, wedding bands, take your dress out of the bag, hang it up and fluff it out a bit. *Bonus tip, bring your wedding stationary items (save the date, invitation, etc.) for your photographer to take photos. You should also bring with you any other items you might need throughout the day, such as; makeup refreshers, reception shoes, deodorant, perfume, cell phone, phone charger, medications, wallet, overnight items, etc. Take mental stock of everything and make sure you've got it all, just in case you need to send out a runner for something last minute. DO NOT FORGET TO EAT SOMETHING. I repeat, DO NOT FORGET TO EAT SOMETHING! It is so important that you eat a good breakfast and lunch (even if it's a light one!) on your wedding day. You will need some fuel to get you through the day, since you most likely won't get another chance to eat until dinner. If possible, have a small plate of appetizers set out after the ceremony for a quick snack before photos. If not, have your bridal party pack some snacks for everyone to enjoy. Also remember that while a morning mimosa or two are great to help calm your nerves before the ceremony, you need to stay hydrated and drink plenty of water. It's an exciting and high adrenaline day that will take a lot out of you, so the more you take care of yourself, the better you will feel! What are your favorite pieces of "getting ready" advice? Older PostCatch Up with the Seasonal "In-Crowd"